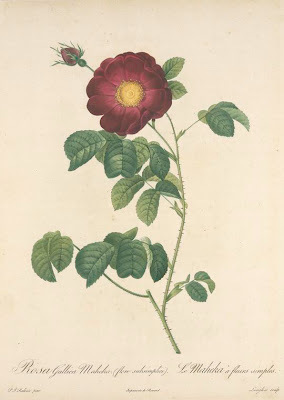 Pierre-Joseph Redouté (1759-1840) is widely regarded as the greatest ever floral artist and the reputation is due, in no small part, to the exceptional quality of his prints. 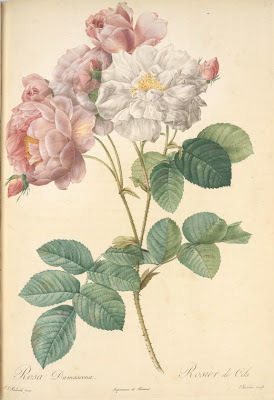 "The most accomplished engravers of the period were engaged to translate his original paintings into stipple engravings, in which the plates are etched with small dots rather than lines. Indeed, Redouté helped refine the stipple engraving process to best capture the subtle effects, luminosity, sheen and dimensionality of his original paintings. 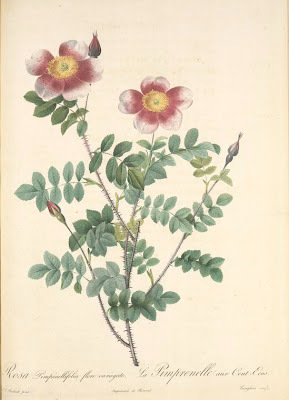 Through a method he invented in 1796, the colors were applied to the engraved plate a la poupée before each printing, “giving to our prints all the softness and brilliance of a watercolor,” as Redouté noted. Finally, each print was finished with additional coloring by hand. 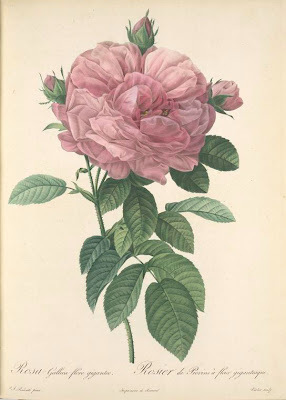 Redouté’s high standards are evident in the striking way in which the resulting prints capture the subtle delicacy of flower petals and foliage." 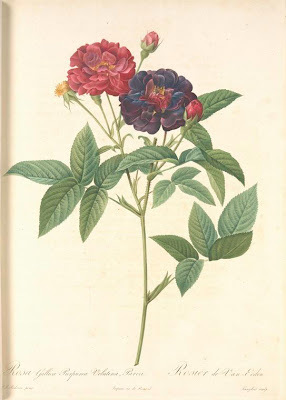 'Les Roses' was published in 3 volumes between 1817 and 1824 and the 170 illustrations depict flowers from the Malmaison estate* of Empress Josephine (mostly). The deluxe original editions were very limited in numbers and were financially unsuccessful. 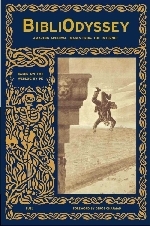 A later octavo version proved popular but only about 300 copies were ever printed. A single original print may fetch up to $18,000. Many of the original watercolour paintings by Redouté (which he sold to reduce debt) were lost in the fire at Tuileries Palace* in 1871. 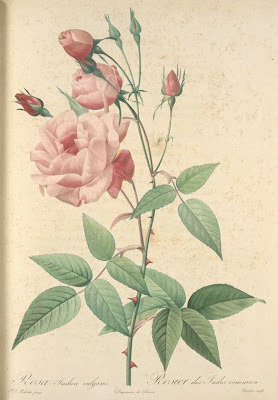 A number of versions of 'Les Roses' are available online. 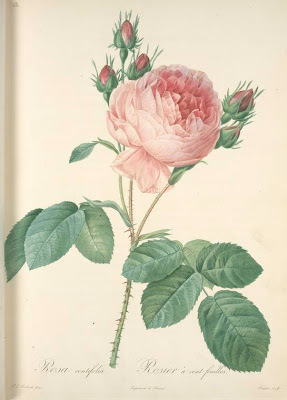 I've opted to display images from NYPL which are probably manipulated with respect to light/colour balance. 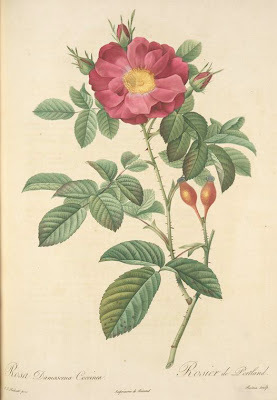 In the second to last image above you can see a comparison to the Library of Congress version which is available from the Rare Book Room, versus the same flower print from NYPL. 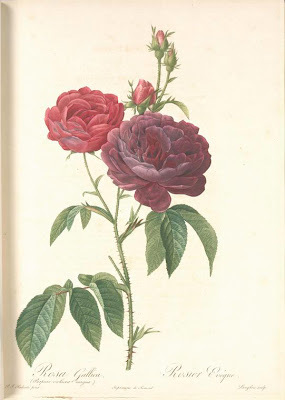 The last image is also from the Rare Book Room which have a second version of 'Les Roses' from the Warnock Library. Quite a few commercial print galleries of course have varying quality (and numbers of) prints available. 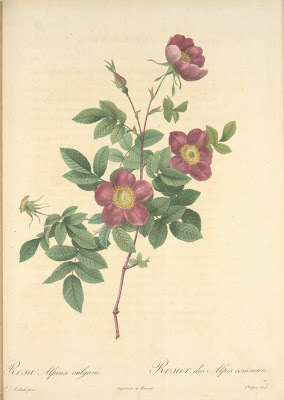 Biography from the Holden Arboretum, Ohio. 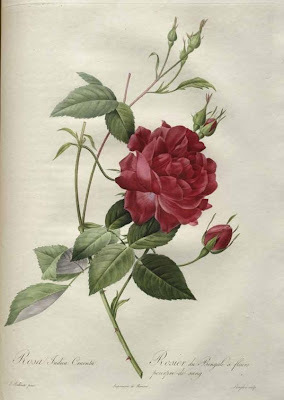 A Picture of Roses is something of a Redouté/'Les Roses' fansite. it's like waking up to choral music. thank you. 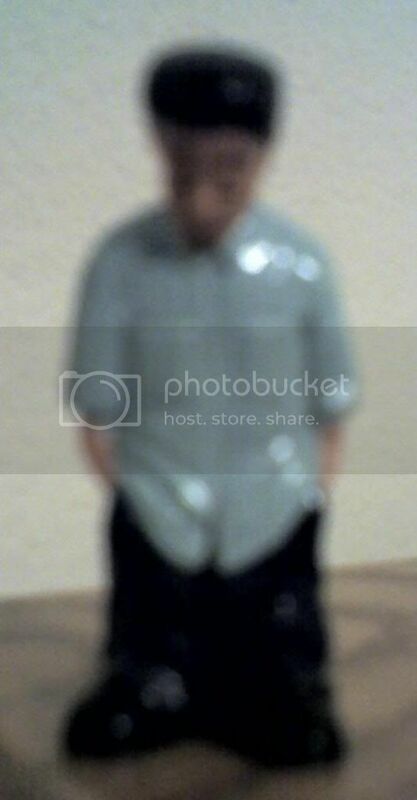 If would like to trade, post my link, then comment or email me and I will post yours on my site as a permanent link. Send what you want to your link to be called and your link please. I would appreciate the linkage, Thanks! It's so incredibly hard to do roses accurately. I don't think I have ever succeeded in painting one to my satisfaction, much less to the standards of this master. I always lose my concentration on petal #25 or so. 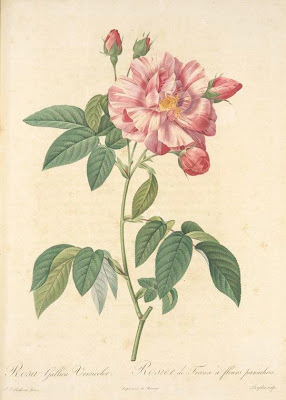 I feel like prints of roses are increasingly neglected in favor of more exotic botanicals (or shells or corals or whatnot). 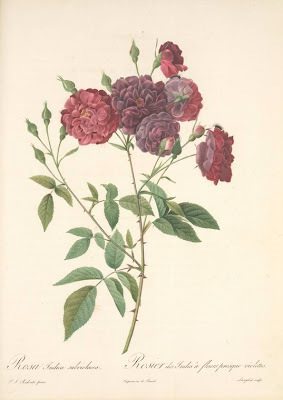 But English roses, while admittedly a little Victorian or Laura Ashley, are some of the most ornate, rococo flowers of all. 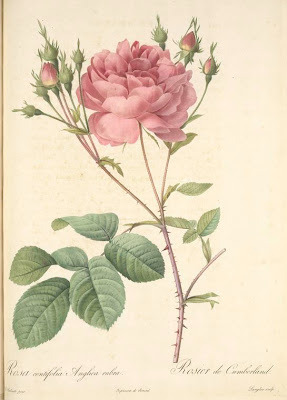 Look at all those petals and thorns, for goodness' sake!